The water temperature has been reaching about 78 degrees. The water has been cool in the mornings with temperatures in the high 70’s-80’s. The catfish bite is picking up. The best bait to use has been mackerel, chicken livers, anchovies and sardines. The water temperature is still warm, so the trout have been staying in the deeper water. No trout catches have been reported. 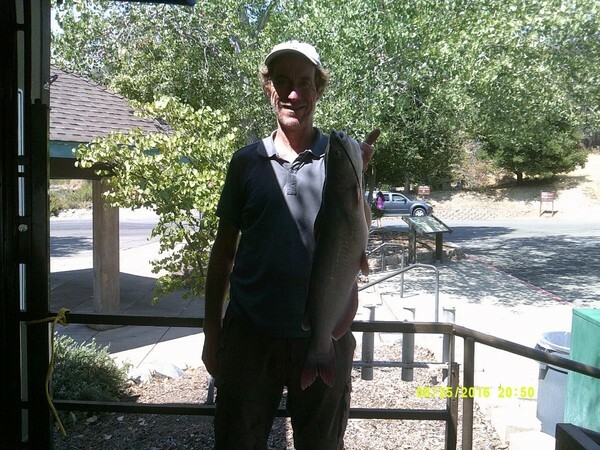 Jon Christenson caught and released 6 bass on robo worms and 7 bass on flukes float tubing in the arroyo. Gabreil Rezendez caught and released 7 bass and he was using plastic worms. A 5lb. catfish was caught left of the 1st dock and shrimp was used for bait. Dave Lee caught a 2lb. and a 5lb catfish fishing right of the boat launch near the cove and he was using chicken livers for bait.